Dust both sides of the ribs with jerk seasoning, salt and pepper. Place in roasting pan, fat side up. Cover BOTTOM of pan with aluminum foil and place in 275 oven for 2 ½ hours. (Until Tender). Remove from oven. 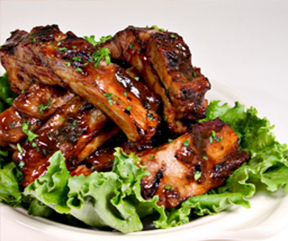 In a bowl, add Worcestershire sauce to barbecue sauce and mix well. Preheat grill. Coat one side of ribs with sauce and lightly brown that side over moderate heat in covered grill (approx. 5 minutes). Coat the other side and turn, browning another 5 minutes. Remove from grill, slice between each bone, and serve.